it indeed worked out now. after renaming the stats, i saw that i didnt have the correct names in the 'opps' category anyway, i fucked up to type in the exact same stat-name so that try was doomed from the start. but now its all fine and im very thankful both to you keepcalm and you monstertruck. i created 3 normal stats: betfold flop, betfold turn, betfold river. to combine the conditionals regarding the floptextures, i get it. but i want to do the same stuff with the street by street actions (villain checks, player bets etc.). but after entering the flop actions, i cannot enter seperate turn actions without them being connected to the flopstuff. 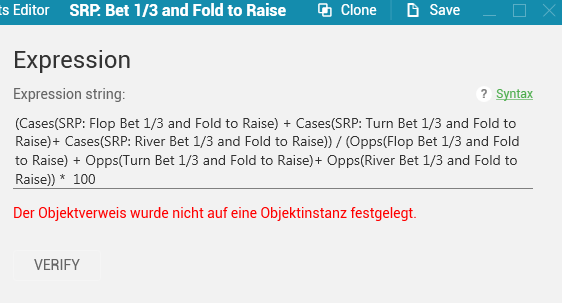 if its not possible in one stat-def: couldnt i create 3 stats (bet small and fold FLOP, bet small and fold TURN, bet small and fold RIVER) and then create another definition which contains all three to get to the same result? could i create 2 stats with one specific line each and then later combine these two to one stat? if yes, how is that done? i want to create a stat-definition that is "Bet small and fold to raise" and i have problems with the conditionals. same problem with a general "bet vs check-stat"
i hope i could convey my point and im grateful for responses. im about to color code my stats. "Color Ranges:	Allows to set specific color which stat should have depending on its value. Please, note, on PokerStars only 2 different colors are allowed in this option." thanks a lot and best wishes! RE: dynamic hud on stars with stars caption?